Hovercraft Training Centers and Neoteric Hovercraft will be featured at this year’s FDIC (Fire Department Instructor Conference). The world’s largest firefighter conference and expo - attended by 35,000+ firefighters, chiefs and instructors from more than 53 nations - takes place April 24-29 in Indianapolis at the Lucas Oil Stadium and Indiana Convention Center. 2) Fly a remote-controlled hovercraft. 3) Get answers to all your questions about rescue hovercraft and pilot training. 4) Register to win one of three FREE Hovercraft Flight Training Courses, valued at $1,575 each! 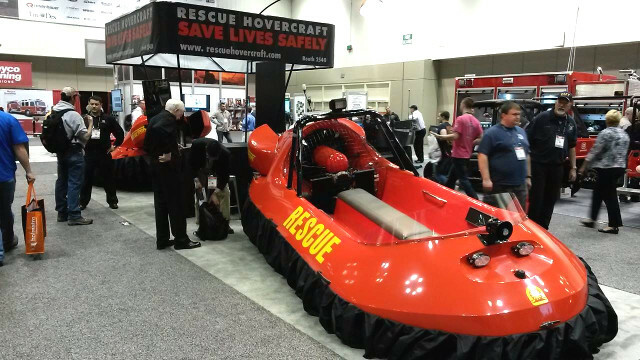 The Hovercraft Training Centers / Neoteric Hovercraft booth at last year's FDIC. Flat bottom Jon boats and other watercraft are of questionable use in shallow water, swiftwater, flood, ice and mud rescues, and they can be seriously dangerous to you and to the lives you’re tasked to save. Come see how a Neoteric rescue hovercraft can greatly improve the safety, ease, speed and success of your rescue operations … while keeping you above the danger – not in it. It quickly flies you into areas where no other vehicle can go, and it’s the only hovercraft with the ability to brake and back up. "The hovercraft gets us into areas that, before, we weren't able to reach, areas that our jet boat can't get into because we ingest debris into the impeller. And the hovercraft saves us a lot of time." "Our hovercraft have saved more lives that all our fire engines combined. Since 1985, more than 255 people have been rescued from Muskegon area lakes using the hovercraft. More than half of them would have drowned not having the hovercraft as a safe rescue tool." "The benefit of having the hovercraft is we do not have to send our personnel into the water to retrieve victims. It can also hover over logs, car tires and any other debris, unlike boats, that could be a hazard in the water. A hovercraft is the answer to a faster rescue - a safer rescue." "Our hovercraft, without question, has saved lives. Much of our county is covered by the Great Salt Lake, and when the water is low it leaves miles of mudflats boats can't reach. We can't get airboats out there. When it's extremely windy it's hard to get an aircraft or helicopter out there, and even walking out is impossible. We were putting rescuers in harm's way, but the hovercraft allows us to hover over mud, ice or water and get right to the patient - to literally reach out our hand and pull them out."